Very warm without being too warm. Leg grippers poor though, constantly need adjusting. Well made & well priced leg warmers. I ordered the medium size, and being about 5'9.5" w/ 33" cycling inseam and 152lbs, they fit great. Used in 0c weather and felt great. I like the reflective strips at the bottom where the zippers are. Very nice feel, and quite comfortable. I went on a morning ride today, and was impressed by the fabric, and how warm they felt. No pinching from the elastic and the fit was perfect. The zippers are an excellent addition. If I ever wear them out I'll be getting another pair ! Perfect for cool mornings that will turn into warm days. Good to 40 degree F depending on your personal tolerance for cold. Zippers will help getting these on and off, but still won't recommend you try to remove them while riding. Seems like a quality product that last long. Size-wise, my inseam is 82 cm, I ordered M and it feels fine but probably S would have fitted better. I have a 32" inseam amid the mediums fit great. The elastic grippers do a great job keeping them in place. They appear to be made of a high quality material. These are very well made. I have very skinny legs and the mediums fit well. The reflective strip by the ankle zipper is a nice touch. The best leg warmers, smooth and hot as hell during winter days!!! Great fit ! And very low bulk but with tremendous warmth. These legwarmers are more value than money! They perform and fit far better than most if not all "big brand" "big price" alternatives for sure ...I haven`t found a downside to these yet. The price and service from Merlin too is second to none ! All in all brilliant !!! Medium fit well, just long enough and good for my skinny legs, at 6'2" and 11st. Very pleased with the quality & so glad I read previous reviews regarding sizing-as a 31" inside leg I was dubious of getting the small size but it was spot on.Excellent value for money. I needed these for the cooler autumn months. Works well with the arm warmers too. Kept me nice and warm. Great value leg warmers that work very well when its cool but not cold enough for bib tights. I am really impressed with the quality of these, they work equally as well as a pair of Gore leg warmers that I own which cost more than double the price of the Funkier's, and actually fit better than the Gore warmers. They stay in place and are very comfortable, and also important to me there are no huge logos on these warmers. Size wise I am 33 inch inside leg and medium are perfect. Very comfortable and warm. Size medium will suit someone with inside leg length 32" or greater I am 31" inside leg and they are nearly to long. Overall good value for money. Got these to wear under bibknickers to double my knee-protection in this cold weather. Good fit on my undermuscled legs. The thigh grippers work very well (unlike some), not too tight but don't wander down. A quality item at a very good price from Merlin. First ride out in cold conditions and I would say my legs were kept nice and warm. Comfortable, warm and plain. No leary graphics, go with just about any kit. Cheap too. 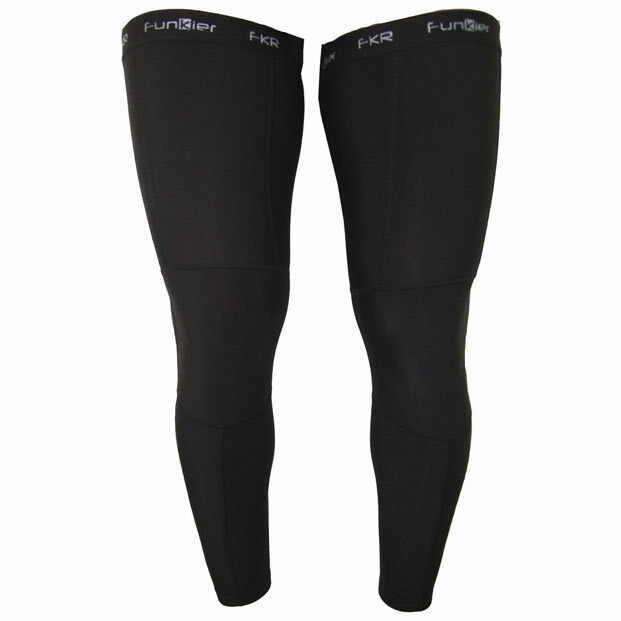 These thermal leg warmers are very good value for money. I bought the XL size being a big chap and the fit is good but a little long so they are made for people about 6'1" to 6'4" and reasonbly muscluar legs (or fat). The material seemed thin at first for a thermal leg warmer but when in use they are surprisingly warm so it must do the job. Build quality is great for the price. Leg grippers work fine. They do have big annoying labels sewn in them but I cut these out as they itched my upper thighs. Overall, a good buy. I had never purchased leg warmers before as i normally wear tights or shorts, but unfortunately Funkier do not make tights with their gel pad? so I decided after reading the reviews to purchase some to use with my Funkier shorts. They appear to be really well made using quality materials. The leg grippers hold them in place without being too tight. I cannot fault the quality or the price. Superb lovely and warm and more importantly they stay up! A very nice set of leg warmers wilth wide comfortable grippers at the top and reflective zips at the rear of your ankles so you can put them on/take them off over your shoes. They provide complete coverage from your anke to your groin and the sizing is absolutely spot on. I've been using them for the past couple of weeks and they make a huge difference on my 5.30am commute, rolling into a small ball for my cycle home when the temperature doesn't justify their use. I am returning to cycling after a few years of running, and thought I would give these a try. Wow really good quality at a fantastic price, just as good as my old premium brand stuff. Speedy service from Merlin too ......... so just perfect.